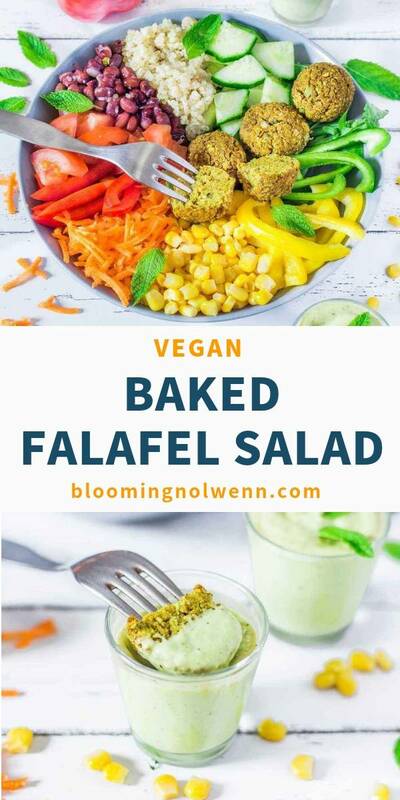 This Baked Falafel Salad is perfect for lunch or dinner. 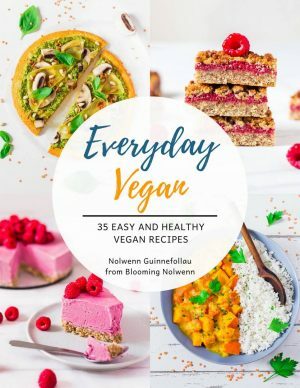 It is very easy to make and the falafels are gluten-free, oil-free and delicious. 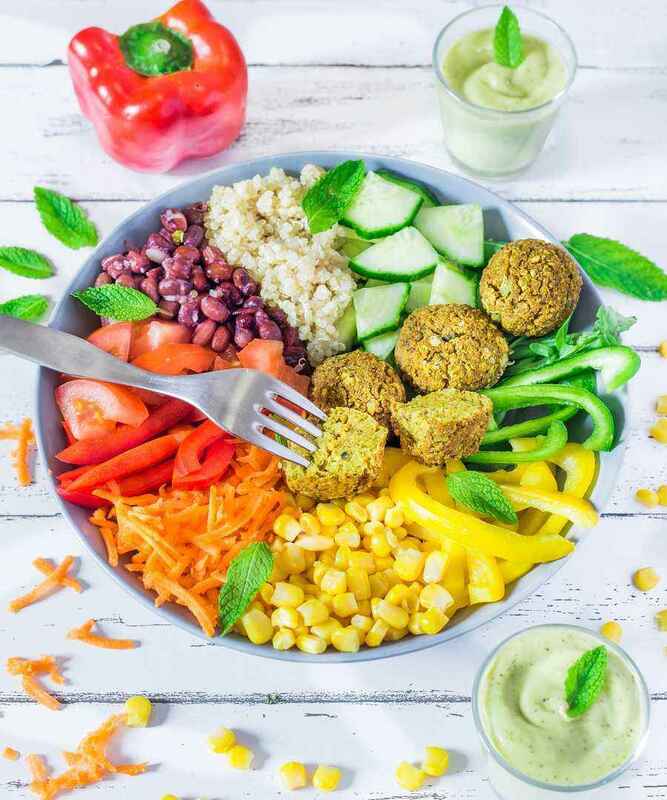 Summer is coming and there is nothing like a delicious fresh rainbow salad with oven-baked falafels and avocado dressing, right? I absolutely love falafels but I find that the store-bought ones are always very dry and contain a lot of unnecessary oil, this is why I prefer to make my own. Making you own falafels is very easy and you get to put the exact ingredients you want. 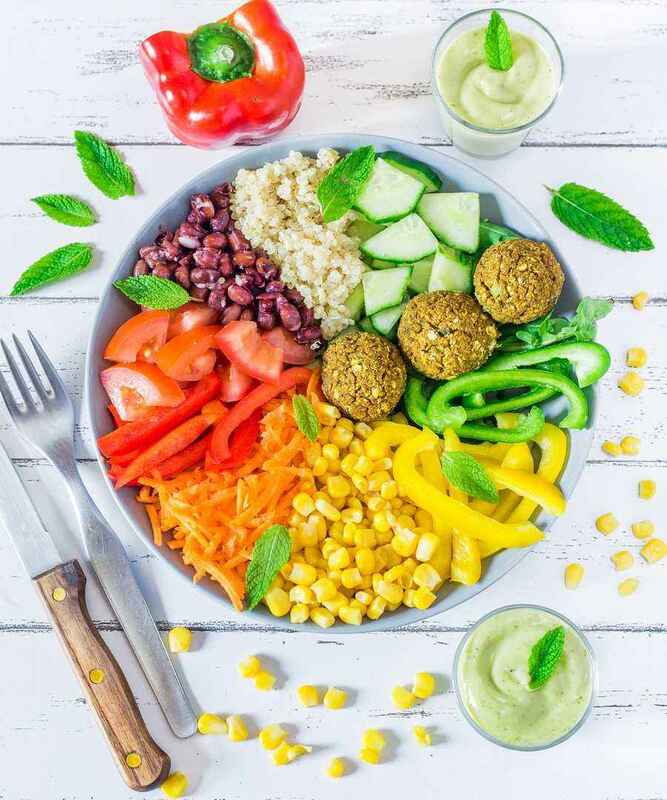 The color of your food can tell a lot about its nutritional value and eating a variety of colors from whole plant foods is one sure method to get as many vitamins and minerals as possible. 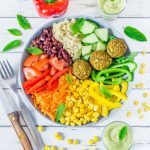 This rainbow salad is filled with arugula, bell peppers, sweet corn, carrots, tomatoes, cucumbers, kidney beans and quinoa. Therefore, it is packed with vitamins, minerals, antioxidants, complex carbs, protein and healthy fats thanks to the avocado dressing. If you don’t have all these vegetables, feel free to adjust the recipe. 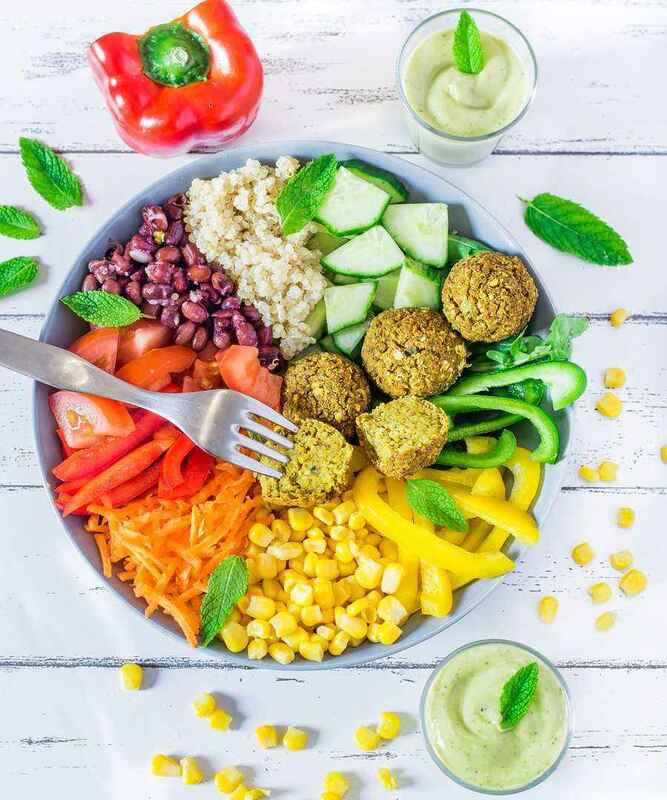 The falafels I made with this salad are crispy on the outside and soft on the inside, spicy, delicious and not too dry. They are very healthy and rich in protein, and will keep you full for a long time. 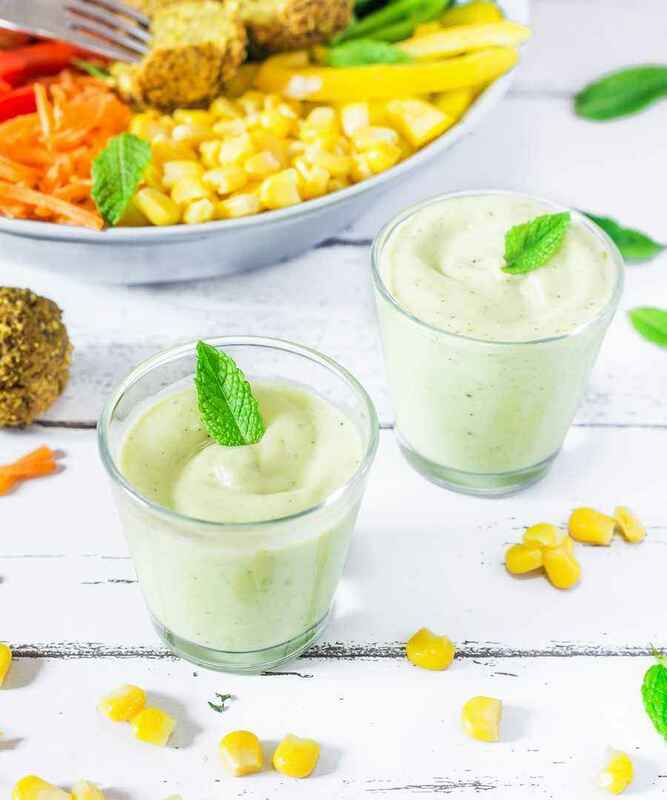 I am also going to share with you the recipe for a very easy avocado dressing which will make the salad a complete meal and provide you with healthy fats. You simply have to put all the ingredients in a high-speed blender and blend until smooth. 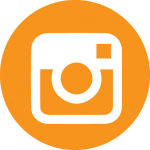 I personally use the Tribest Personal Blender which works great, but you can use any high-speed blender you like. If you don’t have a blender you can also mash the avocado with a fork, dice the garlic, add the other ingredients and whisk everything together, but the dressing won’t be as smooth. This Easy Mexican Salad is a great lunch or dinner idea when you want something fresh but still filling. The falafels are gluten-free, oil-free, crispy and delicious. The avocado dressing is the icing on the cake and makes the salad taste amazing. Chop your veggies and place them in your plate with the quinoa and the kidney beans. Place all the ingredients in a high speed blender or food processor and blend/pulse to combine, scraping down sides as needed. Stop when you obtain a dough with some texture left. Taste and adjust seasonings if needed. I personally like my falafels to be quite spicy. Line a baking tray with parchment paper. Using your hands, form 13 medium-sized balls and place them on the baking tray. Cook at 375°F or 190°C for 20-25 minutes or until golden brown. You can place the leftovers in a container and refrigerate for several days. Place all ingredients in a high speed blender and blend until smooth and creamy. Add more water if you want the dressing to be less thick. Pour the dressing over the salad and enjoy!